In sharp contrast to conventional wisdom – and to other populations in Israel, which are characterized by increasing education levels over time – Haredi men and women today are less educated than their parents’ generation. The education of the Haredi (ultra-Orthodox) and their participation in Israel’s workforce is a subject of hot debate in Israeli society today. But the discussions on this topic are not always based on accurate facts. As such, in the State of the Nation Report 2013 Taub Center researcher Eitan Regev explored trends in education and employment among the Haredim using a unique, more precise method of identifying this population. A number of key findings emerged. First, as is the case for the non-Haredi population, higher education was very important to success in the labor market for Haredim, both in terms of employment and wages. Employment rates of Haredi men aged 25-64 with an academic degree stood at 71 percent, double that of their counterparts without an academic degree. A similar gap, though smaller, was shown for Haredi women. The wages of Haredi men aged 25-64 in full-time employment were 80 percent higher for those holding an academic degree than f.or those without. Given the importance of an academic degree to the economic integration of Haredi families, Regev explores the rates of higher education in this population. 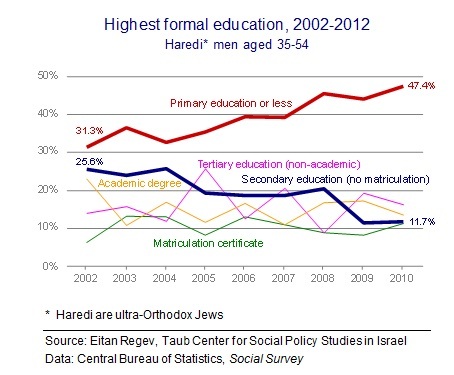 In general, higher education rates among Haredim are much lower than that of other population groups. As shown in the first figure, only 7.5 percent of Haredi men aged 25-44 had an academic degree in 2008, as compared to 11.8 percent of Muslim and Druze men, 23.6 percent of Christian Arab Israeli men, and 31.2 percent of non-Haredi Jewish men. Large gaps in academic attainment also apply to Haredi women in this age bracket. Interestingly, in today’s Israel, women aged 25-44 are more likely than men of that age to hold an academic degree within each population subgroup. There is a striking contrast in trends between Haredim and the other groups with regards to higher education. Among women in the Muslim and Druze, Christian Arab Israeli and non-Haredi Jewish population groups, there has been an increasing tendency to acquire an academic degree over time. Among these groups, women aged 25-44 are more likely than their older counterparts aged 45-64 to hold academic degrees. In sharp contrast, the share of academic degree holders among younger Haredi women (12.8 percent) is a third less than among older Haredi women (17.6 percent). The situation among Haredi men is even starker. In contrast to the conventional wisdom, the share of Haredi men with academic degrees is declining, not rising. Even though more Haredi men are deciding to attain an academic degree, this is more than offset by the many more Haredim deciding not to do so. As a result, while 15.1 percent of Haredi men aged 45-64 have an academic degree, only half of that, or 7.5 percent of younger Haredi men, have an academic degree. 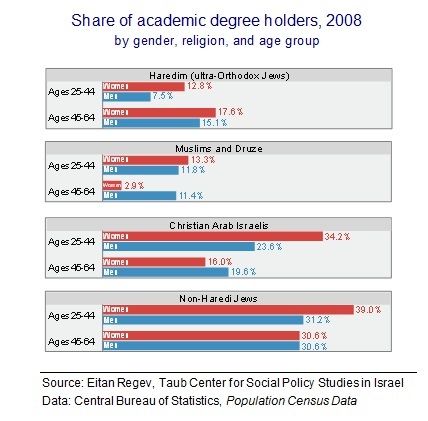 The share of academic degree holders among prime working-age Haredi men remained very low throughout the decade between 2002 and 2010, as indicated in the second figure. Similarly, throughout the decade, a low rate of bagrut certificate recipients (i.e., high school matriculation) was also evident. The largest group by far, and the only one showing a significant increase, from 31 to 47 percent of men in this age group, was that of Haredi men with no more than a primary school education. These trends are a result of more Haredi boys entering the yeshiva system after eighth grade, at which point they cease to receive any basic education in core curriculum subjects and focus solely on religious study. The phenomenon of declining shares of academic degree holders in the Haredi population was documented for the first time in the Regev study and has major implications for Israel’s economy. When the younger generation of Haredi men increasingly has shorter lengths of formal studies and is less likely to hold academic degrees than the older generation, then its ability to find jobs in a progressively competitive and global market falls accordingly. It is no coincidence that while over 80 percent of prime working age Haredi men were employed in the late 1970s, less than 50 percent are employed today – with a multi-decade employment decline mirroring that of completely uneducated non-Haredi men. With the Haredi population growing more rapidly than the rest of the population, an increasing share of Israelis are not receiving the education and tools to participate in the economy. This has some major negative ramifications for future national standards of living and poverty rates in Israel.